The Osage City Kiwanis Club supports the children of USD 420 with a number of service leadership programs (SLP’s) at the various schools. Faculty advisors who are also club members and other staff members provide invaluable guidance for the students in the high school, middle school and elementary school. The purpose is to promote service and leadership as integral parts of their education. It also introduces them to fundraising as a way to help provide funds for their activities and to support special events or organizations. The Key Club is made up of high school students. Their activities include recycling miscellaneous papers/magazines each month, helping with the Kiwanis biscuits and gravy breakfast and supporting school and community activities. Imaginative club fundraising activities for a variety of causes and attending the Kiwanis Key Leader Conference are also a part of the Key Club experience. It’s not all work as fun activities are included. Builders Club involves the middle school students. Some of their activities have included helping with the Kiwanis chili feed, recycling papers/magazines each month, reading to Kindergarten students, sponsoring a Student of the Week and other school and community activities. People have made note of the great help provided by the members. Some prolific fundraising projects have been a part of their activities. The elementary school has the K-Kids program for 5th graders and they are an active bunch. Service projects include paper/magazine recycling once a month, helping the principal with morning duty, monitoring classes, recycling the lunchroom trash during lunch and campus cleanup which involves picking up trash in and around school property. Fundraising has included innovative ways of raising funds, Trick or Treat for UNICEF and food drives including non-perishable items for ECAT which have led to some astounding numbers of items collected. A back-to-school swim party each fall and the Christmas party are a couple of the fun events each year. The BUG program (Bringing Up Grades) is for the elementary students in the fourth and fifth grades. It helps promote the importance of obtaining and maintaining good grades as well as understanding the value of doing well in classes, completing homework, having a good attitude and exhibiting good behavior in school. Students who maintain or improve their grades and classroom presence are rewarded with a pizza party at the end of the first semester and a hot dog feed at the end of the school year. In addition to the sponsored programs, OC Kiwanis funds other USD 420 activities such as scholarships for seniors, the elementary school’s W.A.T.C.H DOGS program, After Prom, Key Leader, the booster club and Teacher Appreciation Day. Kiwanis supports organizations such as the public library’s youth programs, ECAT, the warmth fund and the American Legion’s Boys State. ECKAN has been awarded a generous grant which they are going to use for several areas of need that they support within their organization. Program is to encourage monthly meetings with clients, meet their immediate emergency needs, and work together to encourage a savings account for clients with a 2/1 Match. So they have a total of $1000 emergency fund. Nutrition Class = Currently working with Cheryl Mussatto to offer a Nutrition class to clients, this money will be used to pay presenter fees, cost of food, incentives including (Chamber Bucks) for those who sign up and attend. Dental Program: Used to continue helping clients with dental needs that go beyond the standard cleaning, fillings, exams. What to expect when you decide to open your first account. What laws protect you when you have debts in collections. Adam Burnett, Osage City Chamber of Commerce member and employee of Resource Center for Independent Living, is not only busy at work, he also is active participating in the sport of boccia. He has been very successful in recent competitions at the national level. Burnett, originally of Melvern and now Osage City, has worked at RCIL, in Osage City, since 2002. He was introduced to the Paralympic sport of boccia in 2016. Boccia is a throwing sport that tests an athlete’s coordination, accuracy, concentration, and ability to strategize. It can be played in a team or pair or individual competition. What started out for Burnett as playing “just for fun” became more serious following a third place finish at the U.S. national tournament in 2016. He was then selected to Team USA in 2017 and represented the United States in two international tournaments that year, first in Montreal, Quebec, and then in Cali, Colombia. 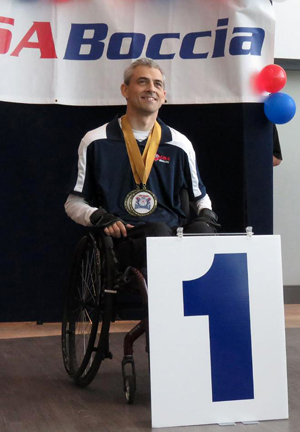 Burnett won gold at the US National Tournament in 2017, but he is most proud of being a member of the first BC4 pair to ever win an international match for the United States, when he and his partner defeated Argentina last summer in Colombia. “It’s really exciting and an honor to wear the Team USA gear and represent my local communities when we travel and compete,” Burnett said. Most recently, he participated in Montreal in April 2018, and won his second national championship on July 1, 2018, in Chicago, Ill. He said he loves the challenge of the sport and credits his wife, Beth, for holding him accountable and pushing him to continue practicing and improving his skills. Burnett said he also thanks USD 420 and Osage City Parks and Recreation for allowing him access to train. “Thanks also to the Twin Lakes Cruisers, RCIL, and countless other individuals who have encouraged me and helped support my efforts,” he said. Burnett’s ultimate goal is to help Team USA qualify for the 2024 or 2028 Paralympic games. To follow his journey visit the “Team Adam” page on Facebook or see www.usaboccia.org. As of June 1, 2018, the Osage City Kiwanis will no longer pick up papers, magazines and shredded paper citywide on the last Saturday of each month. However, the club will continue its paper recycling program. With the advent of the city’s recycling program, the club has had two collection bins as part of that program. It has been decided to concentrate our efforts on the recycle bins located at the city’s maintenance yard, 9th and Main. The bins are available seven days a week, 24 hours a day. Miscellaneous papers, magazine and shredded paper in a plastic bag remain the same acceptable paper items. We encourage you to use this method of paper recycling. An Osage City Kiwanis sign is on the maintenance yard fence identifying our recycling program. The two bins are marked papers, newspapers, etc. and are located immediately behind the sign. We realize that some of our older patrons may find it difficult to come to the bins. For reasons of age, health or inability to get to the recycle bins, you may contact us at 785-528-2891 or 785-217-4586 whenever you have need for us to pick up your papers. Proceeds will support the Osage County Fair! The dates have been set for the 2016 Osage County Fair. The fair will be held June 29 – July 2 in Osage City. This year’s fair will feature all the traditional favorites beginning with livestock shows and judging on Wednesday, the Chamber of Commerce parade, exhibits and competitions, a midway carnival, entertainment, Lions Club food concessions, and a grand finale fireworks display on Saturday night. For further information, contact the Osage County Fair Association on Facebook or by email at osagecountyfair@hotmail.com. Robyn Williams, a financial advisor with the financial services firm Edward Jones in Osage City, and Mandi Potter, a branch office administrator, recently attended a training opportunity at the firm’s headquarters in St. Louis. Edward Jones is at 516 Market St., Osage City, or call 785-528-8177 for more information. Edward Jones provides financial services for individual investors in the United States and Canada.